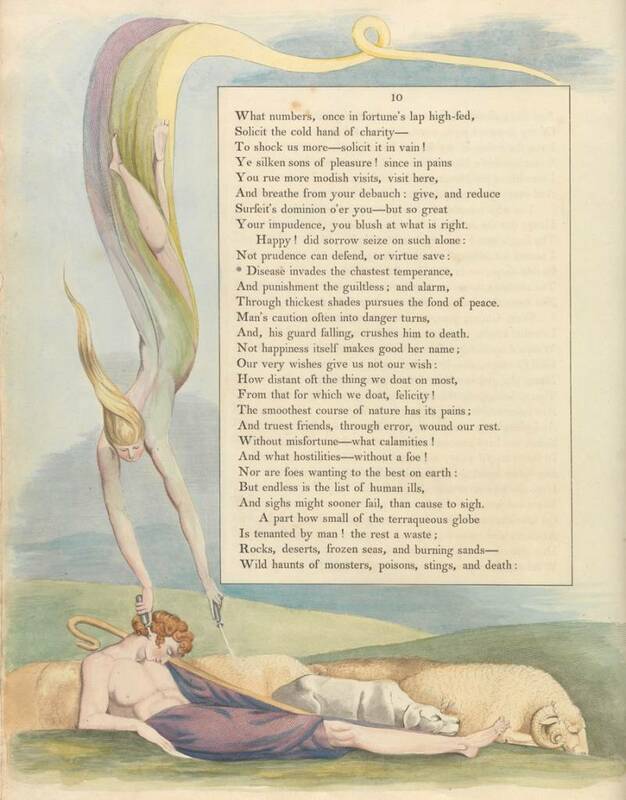 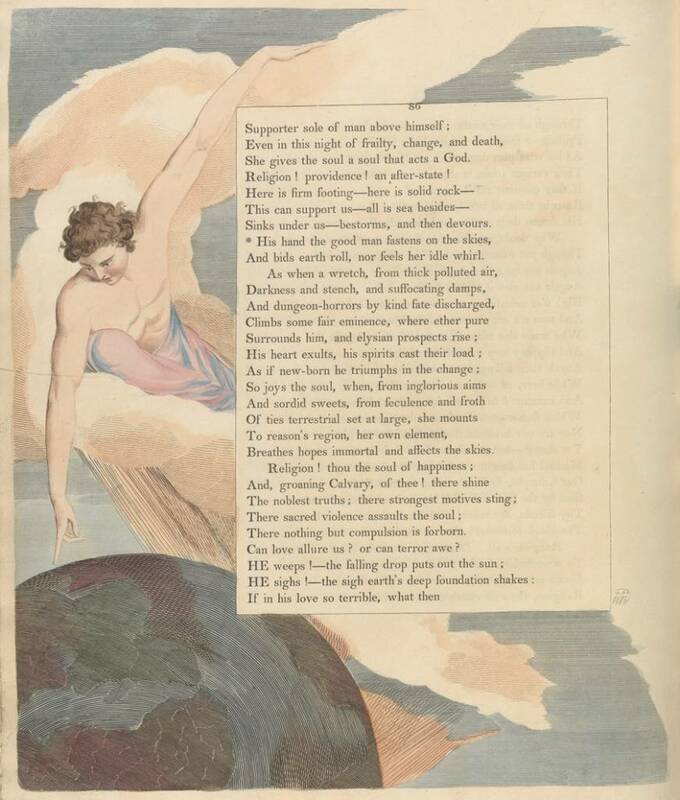 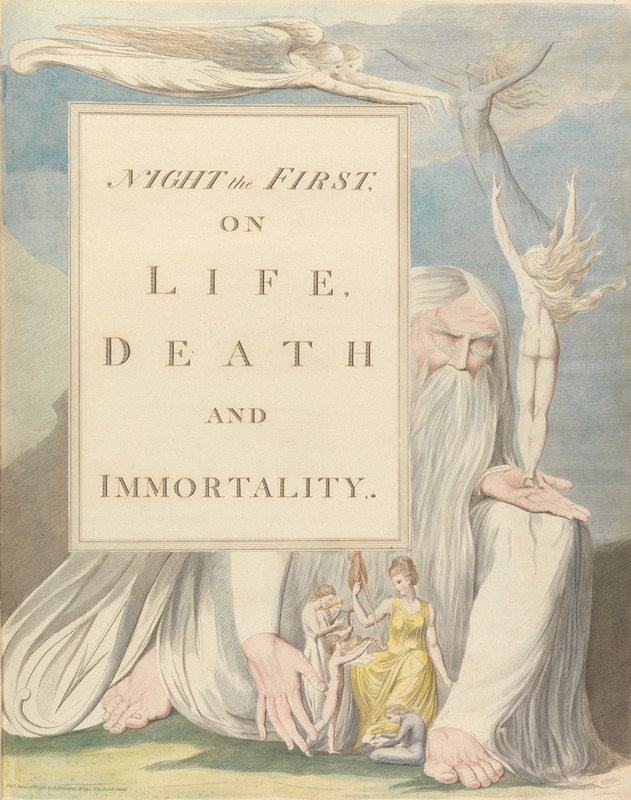 In late 1794, publisher Richard Edwards invited William Blake (28 November 1757 – 12 August 1827) to illustrate a new edition of The Complaint: or, Night-Thoughts on Life, Death, & Immortality, Edward Young’s (1681–1765) long poem written in black verse. 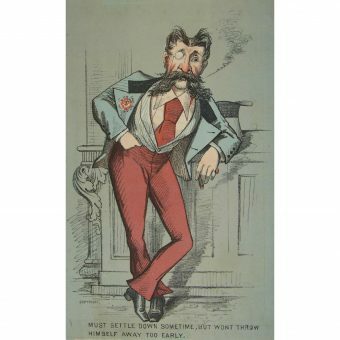 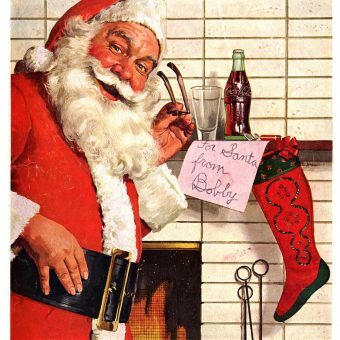 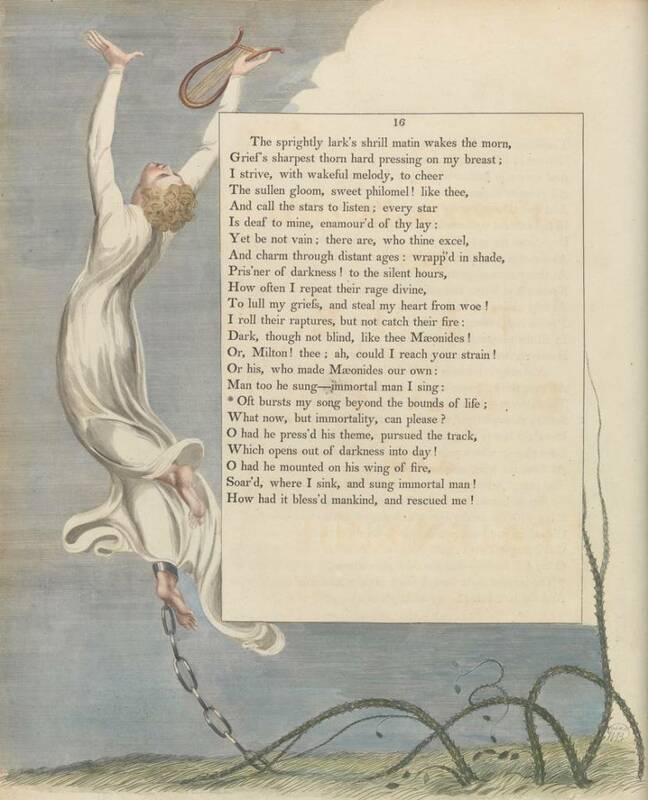 First published in parts between 1742 and 1945, the poem’s lasting legacy is in the phrase “procrastination is the thief of time”. 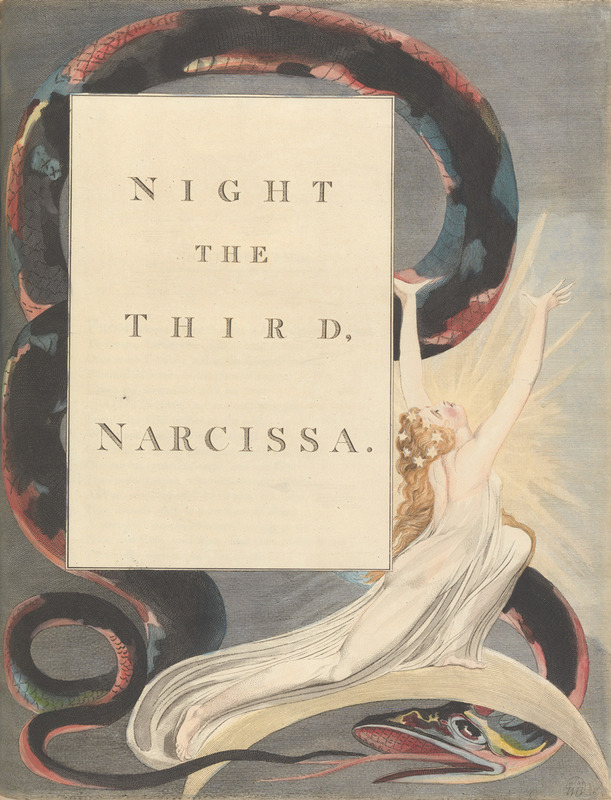 The work, commonly abbreviated to Night Thoughts, is split in nine parts, each representing a night: Life, Death, and Immortality; Time, Death, Friendship; Narcissa; The Christian Triumph; The Relapse; The Infidel Reclaim’d (in two parts, Glories and Riches and The Nature, Proof, and Importance of Immortality; Virtue’s Apology; or, The Man of the World Answered; and The Consolation. 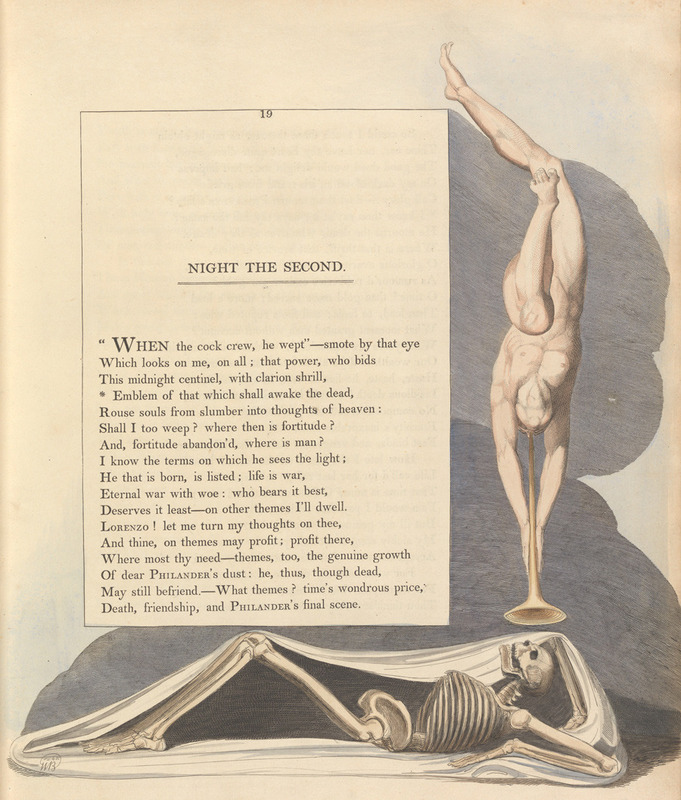 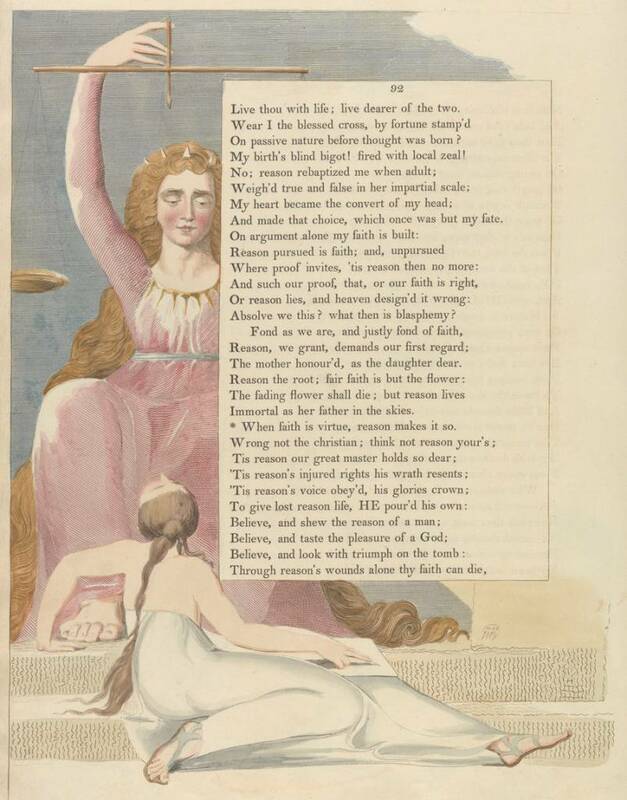 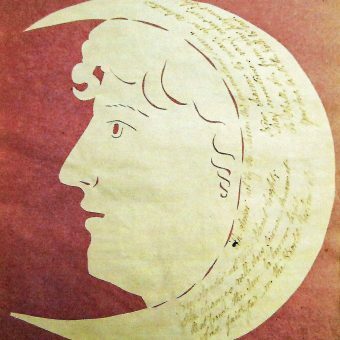 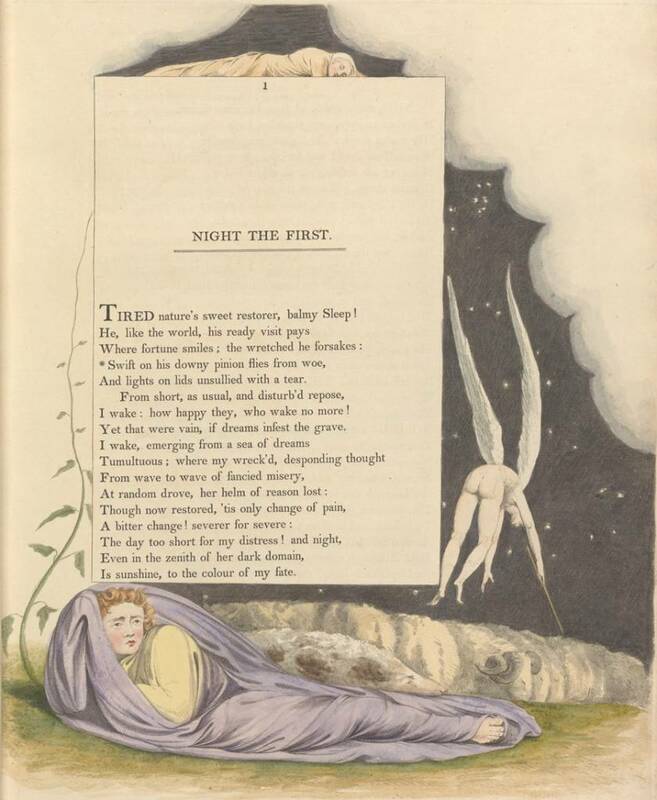 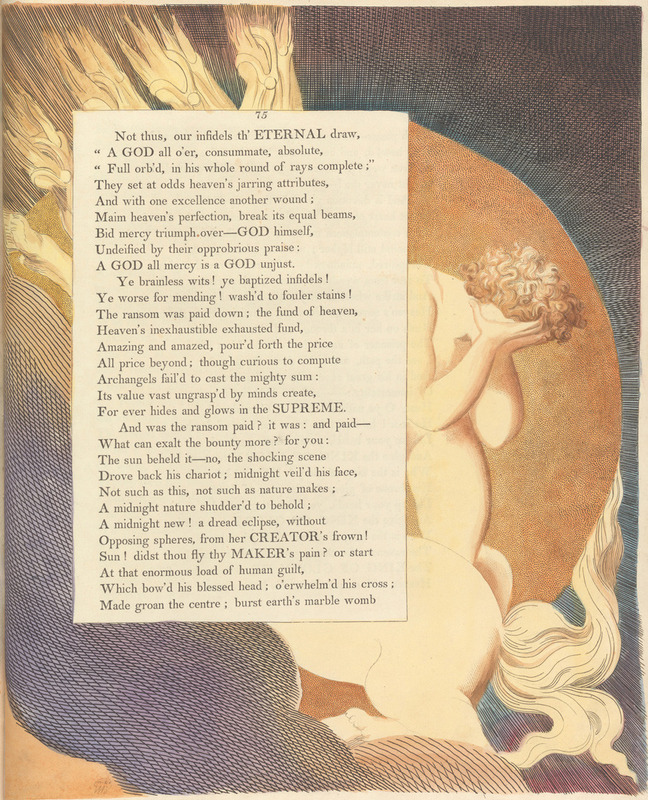 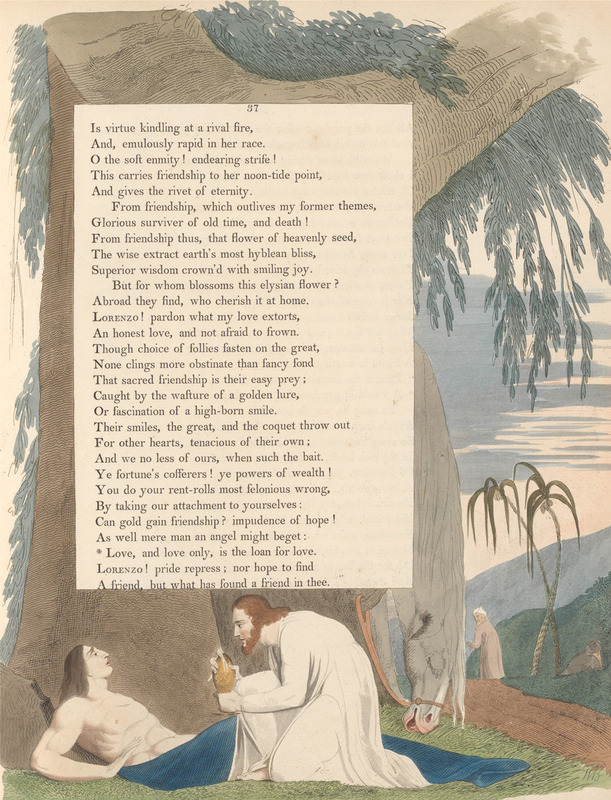 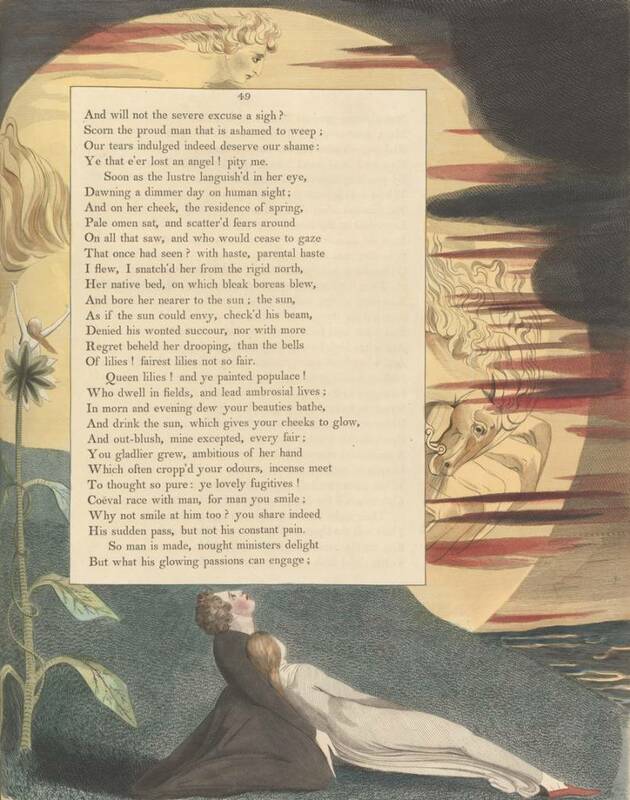 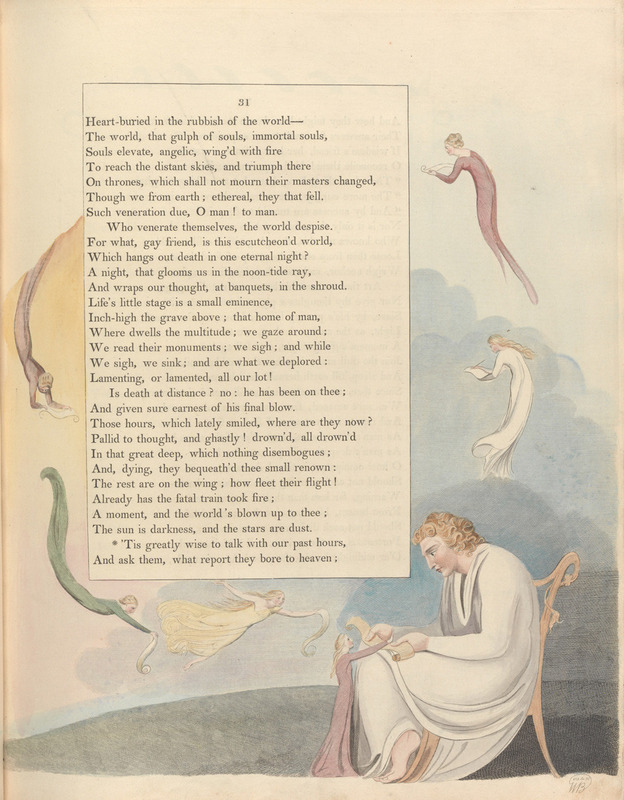 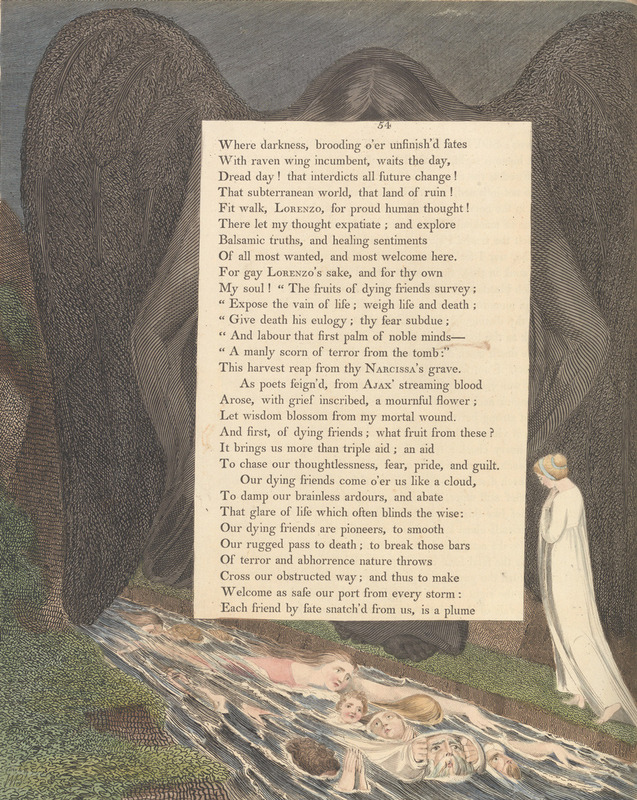 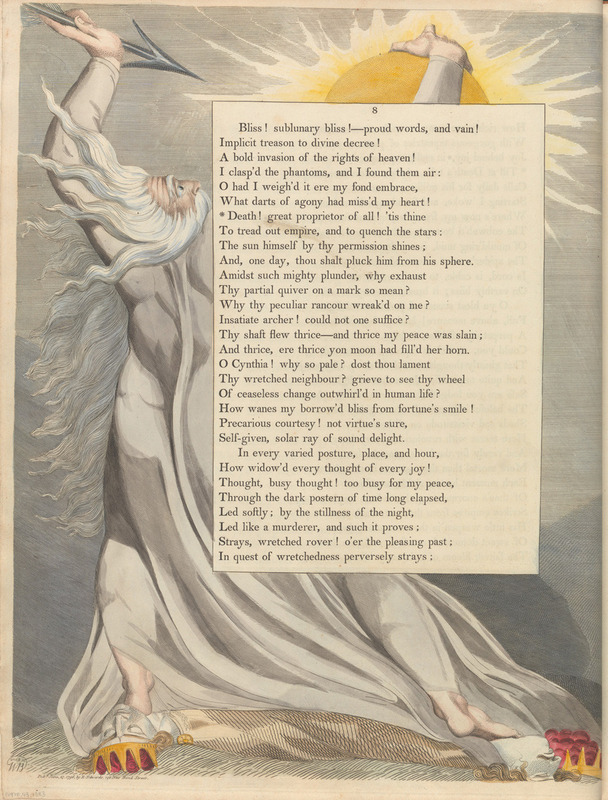 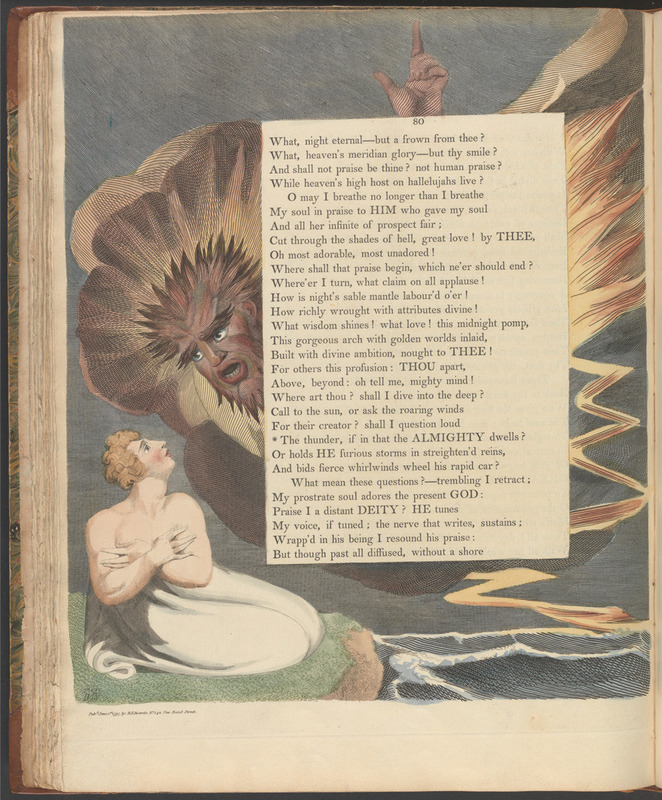 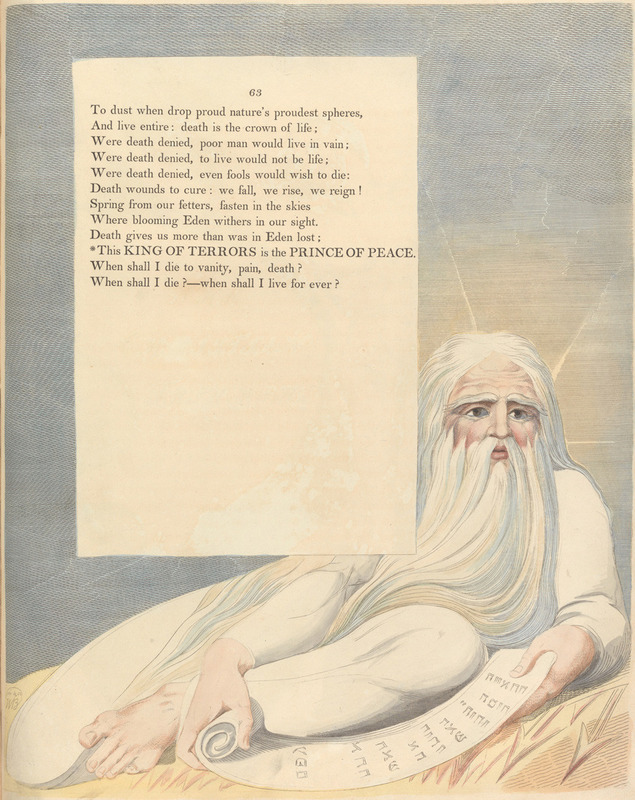 Blake produced 537 water colors (Butlin 330.1-537) illustrating the poem’s nine sections, which Young called “Nights.” Edwards began the project by having the pages from the first and second editions of the poem glued into windows cut into large leaves of Whatman wove paper. 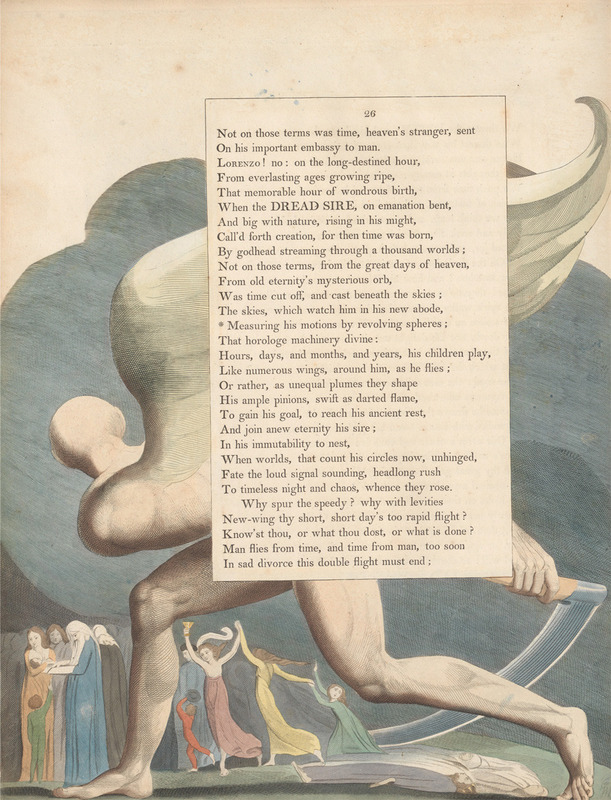 These text pages were positioned slightly off-center so as to create a lower margin greater than the upper and an outer margin greater than the inner, as in most letterpress books. 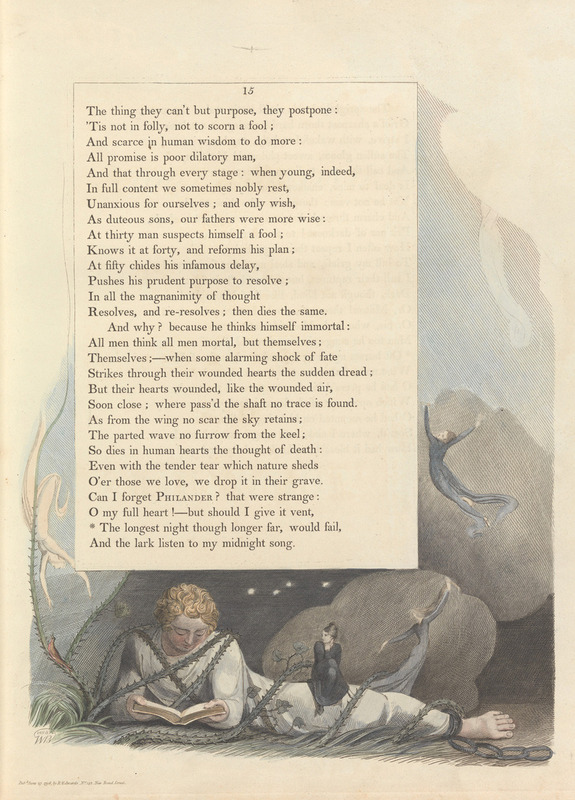 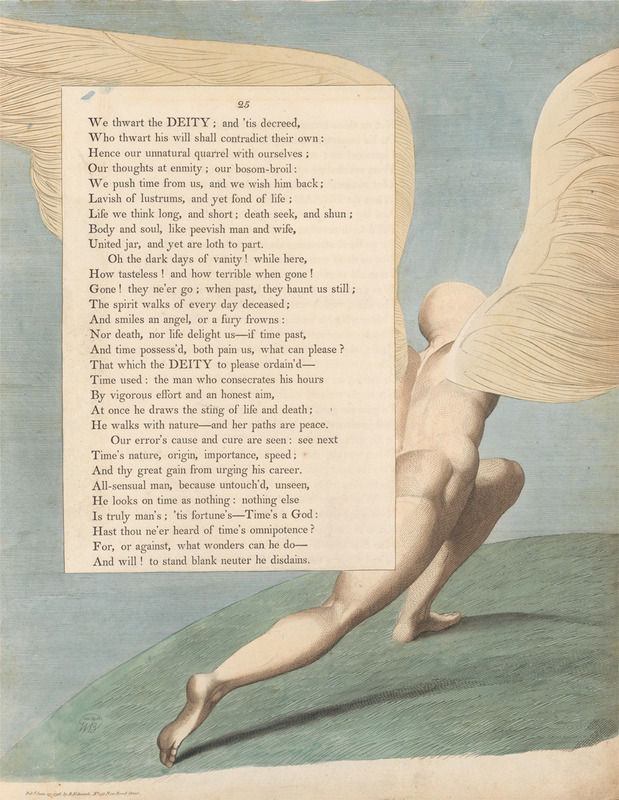 Blake filled these large marginal spaces with his designs—a format retained in the published engravings with the letterpress text of the poem printed in a central framed panel. 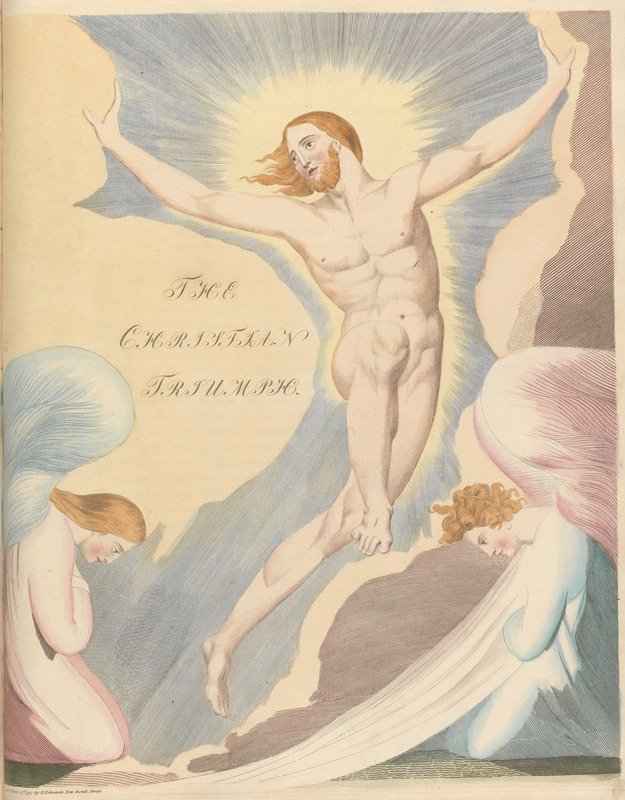 Blake was paid the paltry sum of twenty guineas for his water colors, presumably because he expected to receive a great deal more for the engravings. Although all the water colors may not have been completed by the spring of 1796, Blake began at that time to etch and engrave a selection of forty-three designs illustrating the first four Nights. 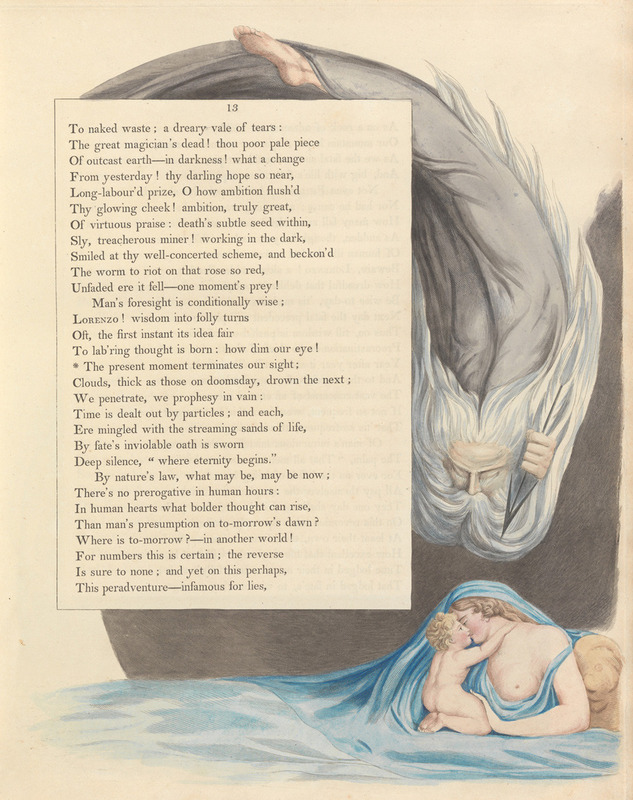 These were published in 1797 as the first of four intended large quarto volumes… Before any further volumes could be produced, Edwards closed his publishing business. 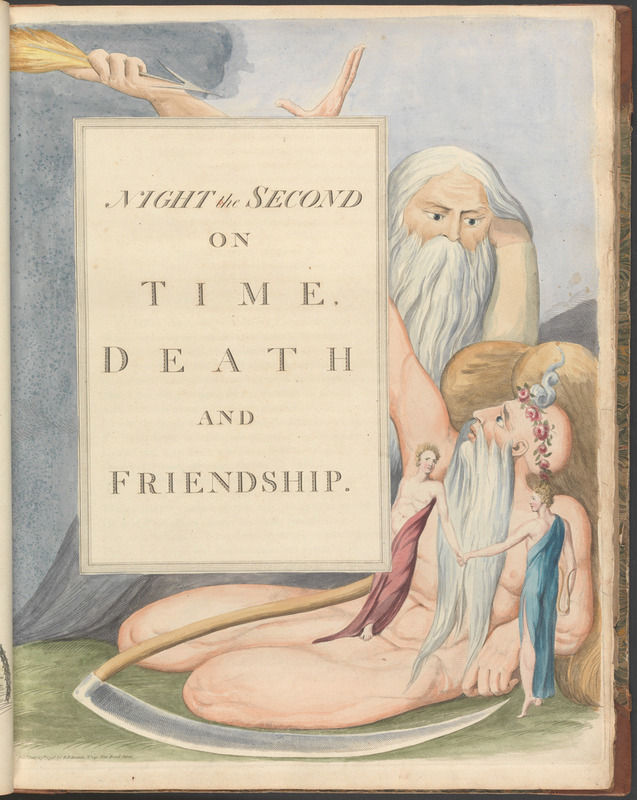 Blake’s disappointment must have been profound. 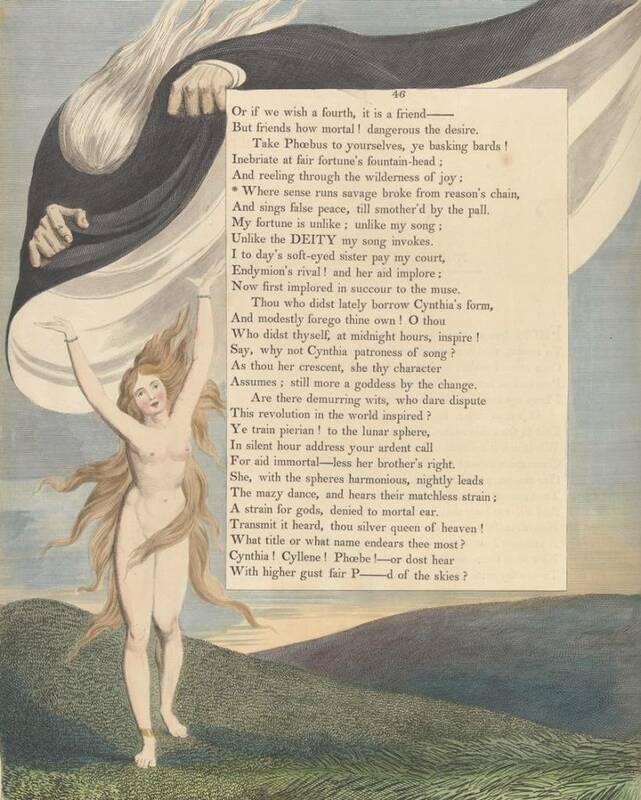 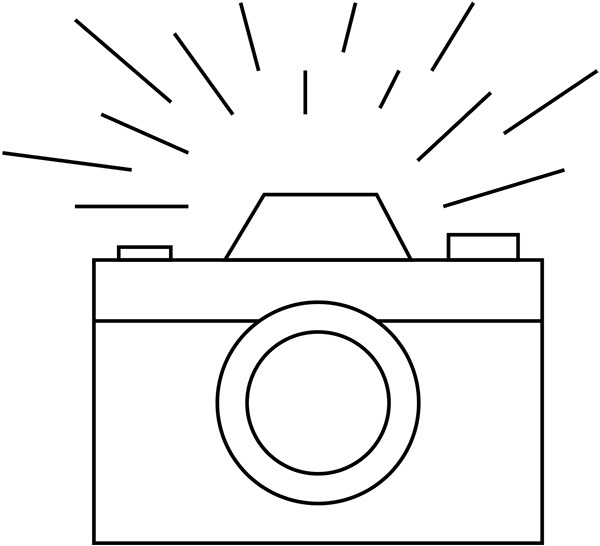 The failure of the Night Thoughts project may have been one of the reasons why Blake decided, in 1800, to move from London to the village of Felpham on the Sussex coast and place himself under the patronage of William Hayley.